One of the most elegant and reliable gate openers in the market is with no doubt the LA400 by Liftmaster. It can work as a single gate operator or a dual operator working in sync with two swing doors. Our work relies on the durability and dedication of our manufacturers to deliver the best products in the market. Liftmaster is one of those high integrity brands that continuously helps to keep our clients satisfied. Our gate opener installation is a task we take on with great attention to safety, details and dedication to making sure our work lasts for years, and property owners have the security they deserve. When you order the Liftmaster LA400 gate opener from Everest you won’t just get a low cost price through our sales offerings, you will experience a class of customer service well above the rest because we treat you like family. As a homeowner or business owner you want the know that when you choose a company and its product, you are making the right decision that covers all your needs and must-haves. You choose the Liftmaster LA400 gate opener when there are so many other options?Our team at Everest are no strangers when it comes to fulfilling your needs and finding solutions to your challenges in finding the right gate opener. is it safe? Is it reliable? Is it easy to use? Is it a good deal? These are the right questions to ask, and there may not be just one gate opener to meet your needs. Our Everest team finds that the Liftmaster LA400 meets most needs, but if it lacks a feature paramount to your needs, our team will work with you to find that ideal gate opener. The first thing we always assure each and every one of our clients is, to take their time and consider all options. We offer our clients every choice down to the smallest details so that their decision comes with confidence. We think you will love the Liftmaster LA400, but if your needs require other options, we have a full team of gate opener players on our roster. 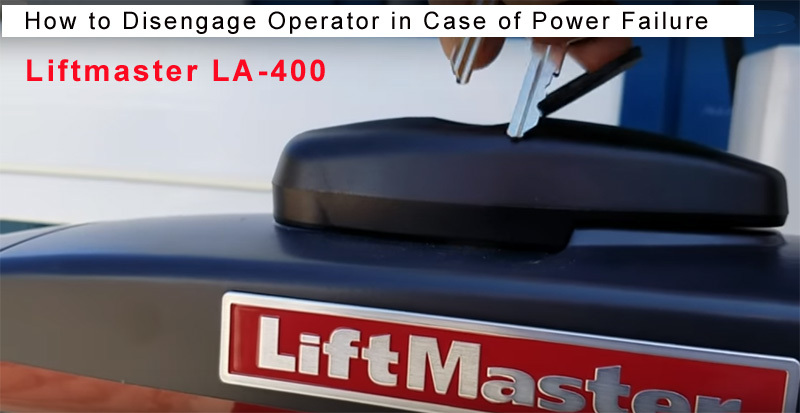 To better help you understand how the LA-400 corporation by Liftmaster opens and closes during a power outage. We recorded this short video for your viewing pleasure. We would love to hear your thoughts, comments, and questions about the Liftmaster LA400, or any other other gate product or service we can offer you. Thank you for stopping by and we look forward to serving you. Everest Garage Doors and Gates Team.